Function meets form in the new architectural lighting fixtures designed by II BY IV DESIGN for Delivro Energy. With an elegantly slim profile, modular connectivity and state-of-the-art LED technology the ZED and HED suspension lights look amazing on their own or composed in a group. Equally suited to modern public amenity spaces or industrial environments these sculptural fixtures are extremely adaptable. Interior Design’s annual Best of Year (BoY) awards recognizes the world’s most outstanding projects and products. 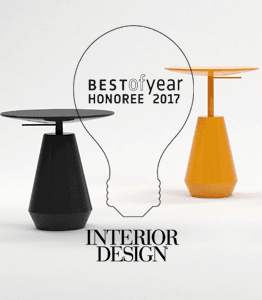 With over 2,300 submissions this year alone we are thrilled to announce that II BY IV DESIGN’s Tear Drop Table was recognized as an Honoree in the Residential/Occasional Tables category. 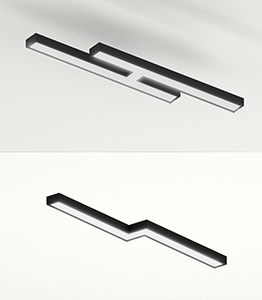 Notably, this sleek, height adjustable piece is our second collaboration with ICF Group/Nienkämper. 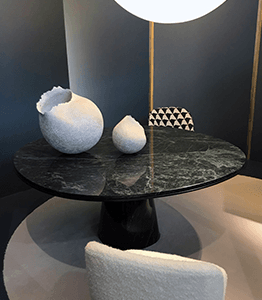 An impressive collection of innovation and talent, Maison & Object has been described as one of the top three European events for Interior Design. Held bi-annually, the II BY IV DESIGN team made some interesting observations between the September 2017 and January 2018 shows; the earlier fair featured precious objects and curiosities within a curated living space while the most recent was a much more stylized affair, focused on furniture within the realm of design…essentially product designer eye-candy!